A grand gesture for the festive. Stargazer Lilies and Limoniums Flower. Depending on availability, other similar valued glasses will be used. Glasses may differ for outstation orders. 24/7 delivery applies for order within Klang Valley (Kuala Lumpur, Petaling Jaya, Selangor, WP) only. For outstation delivery within Malaysia, deliveries are for working days. Same day delivery applicable for order made before 12pm on the day. 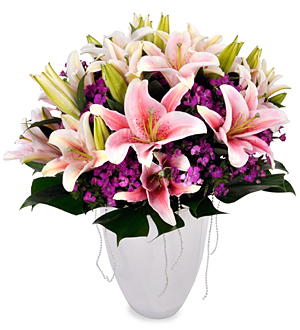 Flowers may vary according to season but only the freshest imported flowers are used for the collection. For flower customization, contact our florist @ Pods & Petals Giftlab at +603-78830233 / +6012-6915200 or sales@giftlab.com.my for enquiries. Flowers in Glasses and Vase is an ideal gift for Birthday, Anniversary, Housewarming, Wedding Gift, Festive Giving to Congratulate or simply to say 'Thank You', 'I'm Sorry', 'Well Done' or "Be Happy".